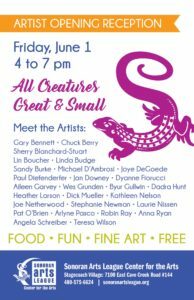 All Creatures Great and Small Gallery Reception Tonight! Gallery Reception tonight! dhSeadragon is excited to have three of her sculptures in the show. Stop in, have some food and drink, take a look at all the amazing art, and meet the artists! It’s a Juried Artist Reception!